The earliest recorded evidence of soap production dates back to around 2800 BC in ancient Babylon when a formula for soap consisting of water, alkali, and cassia oil was written on a Babylonian tablet. Fast forward to 1550 BC and the Ebers papyrus indicates that the ancient Egyptians bathed regularly and combined animal and vegetable oils with alkaline salts to create a soap-like substance. While the ancients have been making it for ages I’ve been fascinated by soap ever since I can remember! So much so that I’m known amongst my friends and family for hoarding sweet smelling bars of Bulgari and L’Occitane which I take home with me as souvenirs from my adventures around the world. 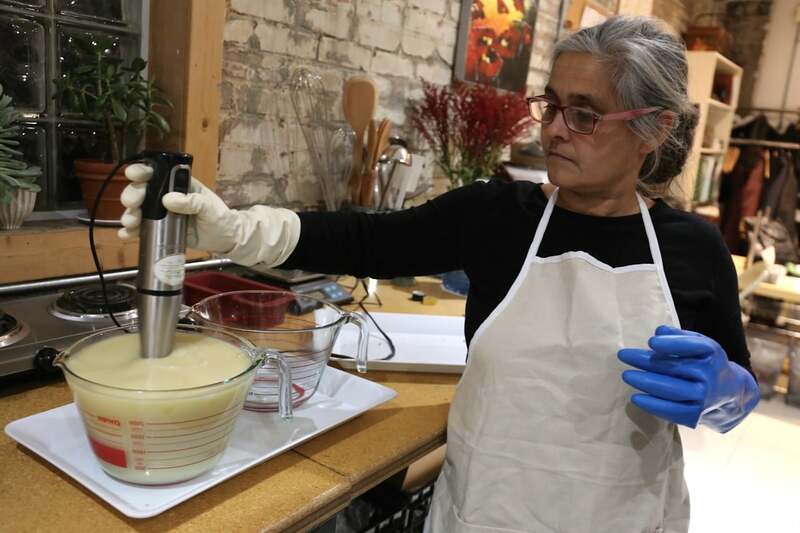 I’ve always been enamoured by how the soap making process is both a science and art so when I learned that Toronto’s own Helen + Hildegard offers a class on Cold Process Soap Making I was thrilled to take a jaunt to The Junction. soap making is a science just like baking. 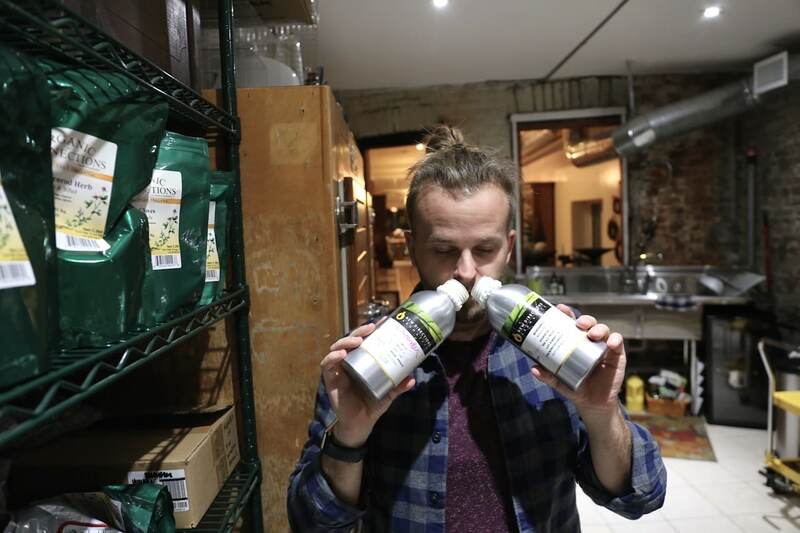 While working with lye can be intimidating, once you’ve run through the process once it’s no more challenging than baking bread or canning pickles. soap making is a natural extension of the kitchen and includes measuring oils as well as formulating a mix of essential oils to create a perfect product. Anyone who enjoys cooking or baking in the kitchen will likely love the soap making process. 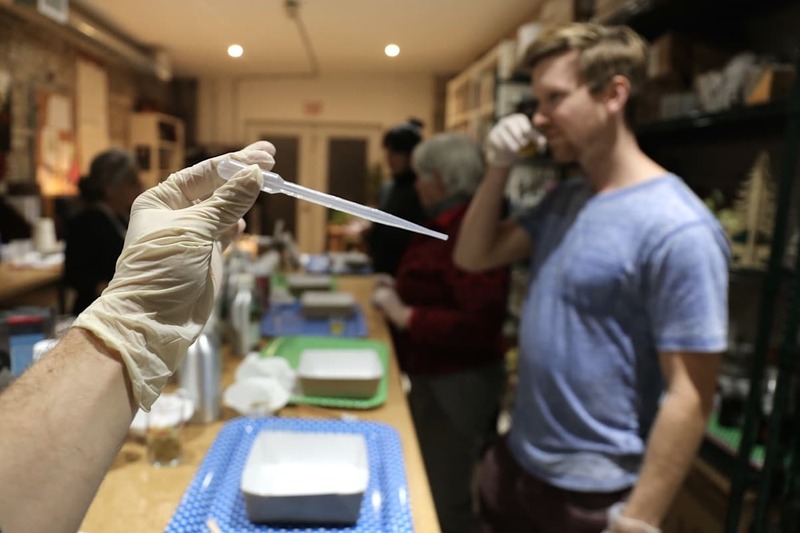 there are an amazing number of Canadian companies that produce high quality essential oils that you can when making your own soap at home which helps support the local economy. Students in the class are provided with a handy take home booklet that includes Clare’s perfected soap recipe as well as plenty of useful tips and tricks. 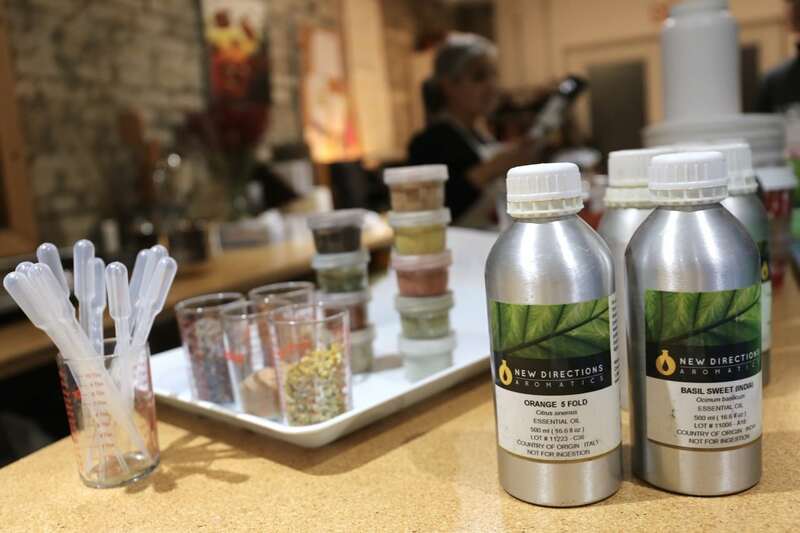 You’ll find a list of local suppliers, a chart featuring the science behind each oil as well as a description of its associated benefit. Each oil has its own fatty acid composition which provide the finished soap with important characteristics like hardness, cleaning, moisturizing and lather. The first step of the soap making process is easy as pie. We simply measured various oils into a pot and then heated them over the stove so they muddled into one uniform liquid. Next we strapped on rubber gloves and added lye to a bowl full of distilled water. After the oil and lye mixtures had cooled to room temperature we used an electric mixer to whip up the final think and creamy liquid which was then poured into our individual moulds. A slew of essential oils sat on the table which we eagerly sniffed to find our favourites. You can chose one singular note or mix two or three to find your own sensory harmony. By sniffing from two bottles at once the volatile aromatics waft into your nose and create an entirely new scent blend. I opted to combine eucalyptus and pine which produced a dreamy aroma perfect for relaxation. Once the creamy oil and lye mixture had settled into my mould I added my essential oils and used a popsicle stick to incorporate it into the soap evenly. The final step is the most fun as you really get to express your creative side. 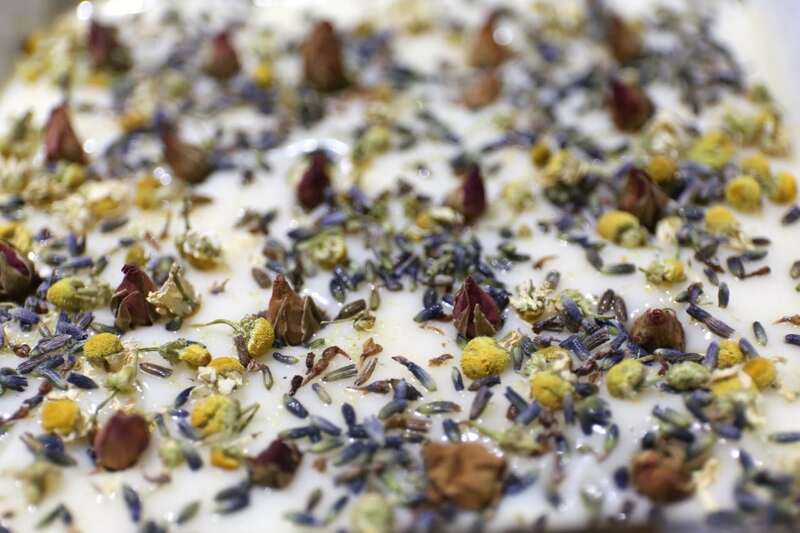 I grabbed a few jars filled with dried flowers and sprinkled lavender, rosebuds and chamomile to create a beautiful pink, yellow and purple adorned product that would make any soap fan swoon!